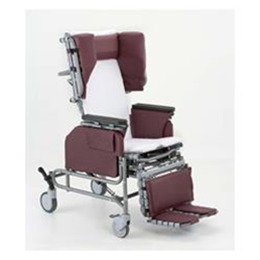 The Broda Elite Chair, model 785, is a superior repositioning chair that provides exceptional resident comfort while reducing the time and effort required of caregivers. Residents with Huntington's Chorea, orSevere agitation and involuntary movement. You can also accommodate hyperextension, change incontinence products without transferring from the chair, or achieve a true Trendelenburg position. The removable swing-away armrests are individually height adjustable, with push-pin height adjustment. Choice of seat or base mounted arms - NEW!